Tamar Friedman may have been one of Hadar’s youngest fellows when she spent the summer of 2012 in the summer intensive program, but her impact post-fellowship has already been significant. After she spent her summer as a rising sophomore learning at Hadar, she didn’t simply return to the typical life at the University of Pennsylvania. Instead, Friedman worked to bring the values, spirit, and style of learning she encountered at Hadar back to her campus. She became involved in and eventually co-chaired Shira Chadasha, a partnership minyan at Penn that prays in a halakhic, Orthodox framework but strives to include women as much as possible. Shira Chadasha also strives to include uplifting Jewish music in its services, in the spirit of Hadar’s Center for Jewish Communal Music. 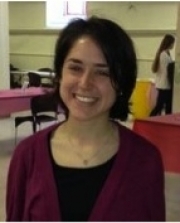 In 2013 Friedman was awarded a Hadar alumni microgrant to deepen the Torah skills of the students praying in her community and on Penn’s campus in general. Most students who participate in Shira Chadasha did not grow up receiving aliyot at the Torah or doing haghbah during Shabbat morning services. Through a series of three workshops, Friedman helped teach students basic Torah service skills like how to receive an aliyah and how to do hagbah and g’lilah,; how to manage services and how to control the room; and how to write and give a d’var Torah. Friedman also organized the first ever intercollegiate partnership minyan Shabbaton in 2013, where more than 120 students from campuses across the country gathered to celebrate Shabbat and discuss how to improve the partnership minyanim at their respective colleges and universities. Friedman grew up in a Conservative home, went to Schechter schools and Camp Ramah, and studied at the Conservative Yeshiva in Jerusalem after high school. But when she started becoming more observant in college she was no longer sure of her place in the Jewish world. “I had felt very alone, I couldn’t find my place,” she said. “I was suddenly surrounded by a community. Not everyone’s questions were the same as mine, but I felt a community and a support network of people who were really seriously thinking about these questions." But on many college campuses, even those with large Jewish populations, the opportunities for exploration are limited. The beit midrash-style learning opportunities are often strictly Orthodox. Hadar recognized a void for students interested in an egalitarian prayer and learning environment. To fill that void, Hadar created Hadar Campus Scholars, a group of program alumni who are graduate students and are given funding run programs on campus. So far there have been Campus Scholars at the University of Michigan and at Penn. Hadar also funds year-round fellows to work in New York-area Hillels. These fellows, with support from UJA-Federation of New York, have worked at Baruch College, Hofstra University, Queens College, Columbia University, and New York University. At Penn, Friedman works often with the Hadar Campus Scholars to host events, and they helped her run the Torah skills workshops as well.